Acting Sgt. Jereme Leslie stands among dozens of stolen bicycles that were recovered following the search of a Dupplin Road property. Members of Saanich Police’s property crimes unit and the Greater Victoria Emergency Response Team raided a property in the 400 block of Dupplin Road on Nov. 7. Police located a massive quantity of bicycles, scooters, parts and accessories, valued at more than $50,000. Acting Sgt. Jereme Leslie said Saanich has seen a significant increase in the number of bicycle thefts in the past couple years. While police have been able to locate the owners of some of the bikes, Leslie wasn’t sure how long some of those bicycles had been missing. “I would gather it was going on for several months,” he said. Two Saanich men, aged 49 and 51, were arrested without incident. The men are facing charges of possession of property obtained by crime, with a court date set for late December. “The bikes have been dissembled and they were parting them out. Rubbing off the serial numbers, making it difficult, obviously, for us to find the rightful owners,” said Leslie, adding it doesn’t appear there had been any attempt to sell the bicycles or parts to any local shops. 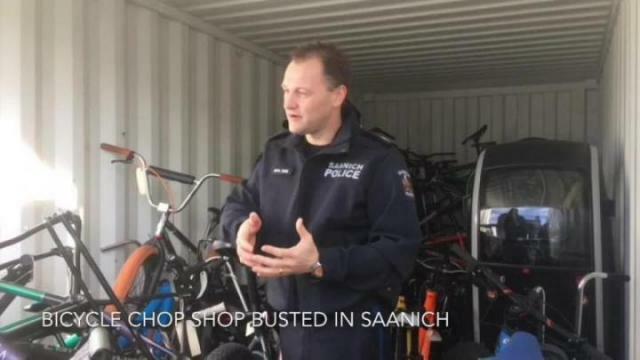 He said police have not been able to locate the owners of a number of the bicycles and bicycle parts, adding photos of the bicycles can be found on the Saanich Police Facebook page. Anyone who believes the property might belong to them or has information on the rightful owners is asked to contact the Saanich Police information line at 1-888-980-1919.